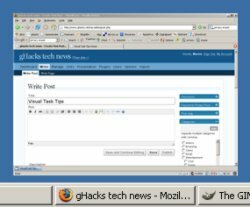 Visual Task Tips is another little freeware application for windows xp which displays a preview image if you move your mouse over a folder in the taskbar. Simply download the 90K file from the developers homepage. After installation you have the option to run it and add it to your windows startup files. To disable it again you start it again and it asks you if you want to disable it. Nettools is a small freeware utility that plays a sound whenever a website that you specified changes its contents. All observered websites are also cached on your local hard drive. The tool has two other features: A web search option and a dictionary lookup. Great tool, really tiny (180k). Grab it while it´s hot. SQL injection is a security vulnerability that occurs in the database layer of an application. Its source is the incorrect escaping of dynamically-generated string literals embedded in SQL statements. It is in fact an instance of a more general class of vulnerabilities that can occur whenever one programming or scripting language is embedded inside another. Some tv stations, like the BBC in Britain, will provide their fellow countrymen with an opportunity to watch the football world cup 2006 in germany live in a streamed version from their webpages. They said on their webpage that "The service will be available to UK broadband users and will mirror terrestrial and interactive coverage." I assume it is free of charge but maybe my loyal British readers could enlight me how they plan on streaming the content. You might remember that I wrote an article in late november called Beginners Guide to securing your pc. You might even remember that I suggested that there was no need for a desktop firewall at all. And you might even remember that I got some pretty bad comments about my suggestion in the comments section. EasyCleaner is a small program which searches Windows' registry for entries that are pointing nowhere. EasyCleaner also lets you delete all kinds of unnecessary files like temps, backups etc. You can search for duplicate files and you can view some intresting info about your disk space usage! You are also able to manage startup programs, invalid shortcuts and add/remove software list. Now this is a nice idea. If you install the firefox extension Googlepedia your google search results will feature another column showing a related wikipedia entry. It uses your local wikipedia as default and disables the showing of google adwords on the search result page. (That´s the area where the wikipedia entry is shown). The football worldcup 2006 is taking place in Germany and will start in exactly six days with the opening match between the host Germany and Costa Rica. Would not it be great to have a listing of all games, all teams, all kick off times and live results ? Sure, you can visit a website of a local news site and hope they update the scores in real time or you could try the excellent firefox extension called FootieFox. Let me introduce the smallest desktop search program available. Snowbird Xp is small, only 26K in size and fast at the same time. Just download and run it from whatever location you like. Snowbird does not index search results which has the advantage that you will always recieve up to date information. Some features have been updated in the new release, amongst them is the capability to search in word documents and excel spreadsheets. A Beginner's Guide to What Goes on Inside that PC published by extremetech a few days ago tries to explain the components of a personal computer without the "geek" language. It aims at a audience that did not have the time or desire to understand how a pc is working. The eight-parts article begins with an introduction and goes on by encouraging everyone to take a look at their own pc. (After saving all work and the like). It would be a good way to print the article to be able to read it and look at the turned off computer at the same time.